Camera Awesome by Smug Mug is an appropriately named iPhone photography app. It is awesome, as well as cool, smart, witty, and fun. If you really love to play with light, texture, and effects, then you’ll enjoy working with Camera Awesome. But, Camera Awesome has a fairly hefty price tag. 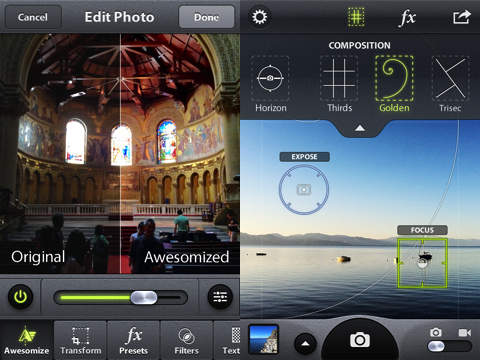 You’ll need to make several in-app purchases to continue to “Awesomize” your photos and videos. Camera Awesome lets you shoot several photos and videos in succession, or you can choose to work with the great tools and effects. The camera within the app is very similar to the iPhone camera. You slide a bar to choose between photo mode or video mode. You touch the flash icon to add flash. You can take photos or make videos of yourself. The corners of a box pop up from time to time to help you focus. The Camera Awesome camera would definitely be more awesome with some additional tools and features to help you frame, focus, and steady your shots. 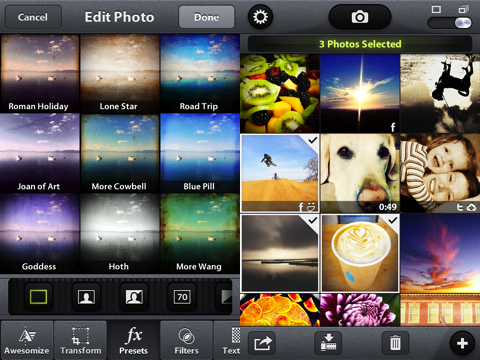 You can also choose to add photos from your iPhone’s photo libraries. From the Camera Awesome camera roll, you can set up one-touch sharing. You can integrate your social networking accounts like Facebook, Twitter, Flickr, Picasa, Photobucket, and Smug Mug. You can also set up one-touch sharing via email. Camera Awesome absolutely excels at adding texture, effects, and refining features to “awesomize” your photography and videos. You select your photo and touch the magic wand icon. The edit photo function has a scroll bar of tools at the bottom of the screen. The “awesomize” tool dramatically adjusts the light. One of the coolest features is the “transform” effect. You are cropping the photo, but the interface is fresh and interesting. The photo is divided into a grid that responds to gestures. You can choose from several default shapes, but then you can move your fingers along the screen to customize further. If you catch a great shot of a sunset and your neighbor pulls into the driveway, it’s not ruined with Camera Awesome. You just crop and manipulate the custom settings for a visually interesting and unusual photo. You can also play with the clarity, light and texture with gesture-controlled adjustments that pop onto the screen with one touch. You can choose from incredible photo effects to add that vintage Instagram meets Hipstamatic vibe. There are literally 108 effects, 63 filters, 63 textures, and 63 frames. For each category, there is a great interface where you see thumbnails with the name of the tool. The names of the effects are hilarious–“More Cowbell,” “Artsy Fartsy,” “White Russian,” and “Morning After.” You are reminded, “Your first taste is free.” After your create your first Camera Awesome photo or video, you will need to make in-app purchases. You can purchase packages of nine of each category for $.99. That is $3.96 for nine photos. And, this is what makes Camera Awesome not so awesome. It’s expensive. There are several great features that are included in the Camera Awesome iPhone app, but the really cool tools require an investment above and beyond comparable iPhone photography apps like Camera+, Snapseed, Luminance, Instagram, and Hipstamatic. Normally, a free download followed by expensive in-app purchases would suffer in the rating. In this case, Camera Awesome brings some highly innovative tools and capabilities to the iPhone photography world, and that level of expertise and performance deserves praise. AppSafari review of Camera Awesome was written by Jenni Ward on March 20th, 2012 and categorized under App Store, Free, Photos. Page viewed 4909 times, 2 so far today. Need help on using these apps? Please read the Help Page.